What Day Of The Week Was September 29, 1979? 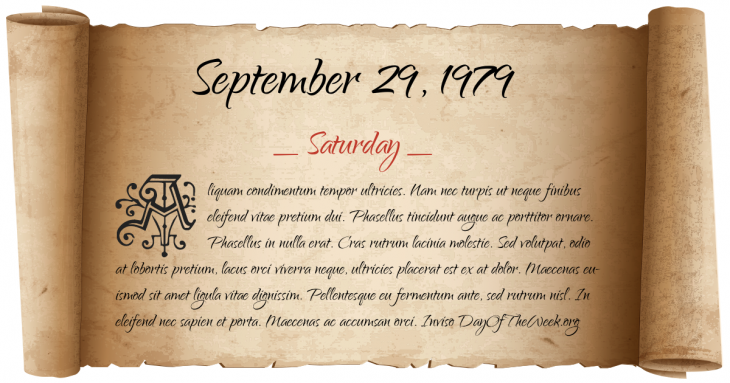 September 29, 1979 was the 272nd day of the year 1979 in the Gregorian calendar. There were 93 days remaining until the end of the year. The day of the week was Saturday. A person born on this day will be 39 years old today. If that same person saved a dollar every day starting at age 6, then by now that person has accumulated $12,262.00 today. Pope John Paul II becomes the first pope to set foot on Irish soil with his pastoral visit to the Republic of Ireland. Who were born on September 29, 1979?